It’s time for me to stop this insane existence of life ‘in a funk’ to getting myself ready to embrace positive things! First, let’s take inventory: job? no; money? no; health? relatively good; familia fine? thankfully, yes. Notice what’s good? the really important things — job and money are important of course, but cannot be the main reason that I get out of my funk — I have decided that I must have a better reason than that … I’ve lived life working toward one goal, making a good career for myself, and have not worked on any other area of my life. So LOGICO…OBVIO…when the house came tumbling down in front of my face…it was a house of cards — with nothing of value inside! Spiritually and familia-wize, I had not completed one project, not attended one meeting in good faith, not cared to invest time in these projects, so WHY would these things be in order when everything else went freaking crazy? One thing that I notice gives me a renewed sense of hope and positive attitude is when my ‘children’ and ‘godchildren’ can look at me and still see that I’m the best, the coolest, la mas chingona, the one who can get things done, the one they turn to, the one they want to tell about their lives! If that doesn’t help you to stop feeling sorry for yourself and to get yo’ s*%# together, what will? For some of these kids, it’s not being able to to to the University because of budget cuts; others not able to find a job after many training programs; others not being able to DO anything with that hard-earned University degree, others simply unable to find a job … of course, I think that my children are the best that life has to offer but what really makes me proud: they don’t stop trying to find ways to make it happen for themselves even with all of the road blocks in their way! Now if they can keep trying, now why can’t I? 1. Embrace failure…embrace setbacks: they hurt but are the door that lead to my future. 2. I may have lost my job, but I have not lost my talent. And with ny talent, I can get back on your feet. 3. Try not to involve the world in my desmadre when I have nothing positive to offer. Momentum – that feeling that you get when you can feel the stars lining up, when things are going your way, when people return your phone calls, when you get your S#&% handled, that little buzz you get when you know it’s your turn and your time. I’ve had momentum for over 20 years and now – nada. It really throws me off balance to feel things at such a standstill. With the way the economy is now, I know that I’m not the only one to feel this way. Of all of the craziness that has hit me in 2010, it is this loss of momentum that has literally thrown me to the wall. Like any major loss, it hits you in waves and I’m certainly going thru one right now. Like many folks who define themselves by what they do more than anything else, it’s not a cool feeling to feel out of the game, to feel like you’re not ‘in’, to feel old, and to feel like your time has passed. If you’re looking for a job, peor (worse) – because you need to project energy, vitality, and a positive attitude in order to close that deal and get what you want! Part of me feels very lost … do I really want what I’ve had for 20 years? Is it enough? Have I ‘been there, done that’? This lost feeling is not comfortable either, as I’ve always known what I’ve wanted, never a question in my mind. Another part of me feels like I desperately needed a break from the rat race, that NO way would I have made any changes without God intervening and changing it all up for me, and that, as uncertain as things are, I feel as if I’m being led – to what? Quien sabe? I would like to, eventually, see this setback as the beginning of my comeback. Maybe it will help me to visualize what I would like to find in my life once the dust has settled – not in any particular order: to have a job that makes me feel like I’m helping others, to be able to work whenever I want, to be able to have days off and not feel guilty, to keep spending time and enjoying my familia, to make room for my friends and, oh could it be, get a man in my life, to get ahead in my bills, and to live with health, peace and joy. Had a hilarious time this weekend LAUGHING with friends. Friday, Saturday, Sunday, and Monday … I haven’t felt this kind of stomach ache in a long time and dragging around my place this morning ‘desvelada’ tired from a fun weekend with no liquor or drama involved – just a lot of fun situations and a lot of laughing. Love it that, more and more, I’m starting to be more like me how I used to be. I was always the one who was laughing, joking around, loud, crazy, fun-loving…until work and stress got so in the way of my finding joy in the simple things in life, to the point that I would stop myself, if I started to laugh, like it wasn’t normal. What was that all about? Laughter didn’t stop today either…earlier this afternoon I was at the Ranch, Mom and I were in the living room watching TV, and she broke out with a funny comentario on what we were watching — don’t you know we BOTH started busting up laughing! It made me happy to see Mom in good spirits even though she’s still a little under the weather with a bad cough! Take a minute to LAUGH today!!! Dealing with your rage and grief will give you life. This is both the good news and the bad news. The solution is at hand. Wherever the great dilemma exists is where the great growth is, too…there is always something ending and something beginning. Yet at the very center of your spiritual identity: is YOU. Fabulous, darling, hilarious, screwed-up you. Beloved of God and of your truest deepest self, the self that is revealed when tears wash off the makeup and grime. The self that is revealed when dealing with your anger blows through all the calcification in your soul’s pipes. The self that is reflected in the love of your very best friend’s eyes. How cool is this? Love the part about the ‘great dilemma’ making you grow and become more ‘you’. Earlier, I was a mess of tears; but tears always serve to clear my head for a minute. I didn’t arrive at the perfect solution YET but, Si Dios Quiere, I’ll know soon enough what my next move will be. Can’t wait to feel like myself again! I hope that you have gotten sufficiently tired of hitting the snooze button; I know that what you need or need to activate in yourself will appear; I pray that your awakening comes with ease and grace, and stamina when the going gets hard. To love yourself as you are is a miracle, and to seek yourself is to have found yourself, for now. And now is all we have, and love is who we are. Isn’t it a trip how we never stop learning? I’m definitely tired of the same ole thing; and love her comment about awakening with ease and grace versus stamina. Today was most definitely a ‘stamina’ day, a day to break out all of the faith! Change is definitely in my immediate future … it feels like the change will be major … and not knowing makes me anxious. This article stopped me in my tracks and settled me down…usually when I’m stunned into silence, it means that the absolute truth is in right in front of me. I don’t want to hide under the covers anymore and ignore the truth. Change is coming, I figure if I embrace it, that my awakening WILL come with grace and ease…y tu que piensas? These quotes relate to life as much as to music and the creative process … I also like one that my dad said once that I’ve never forgotten … this was when he was having a conflict with a security guard at a gig back in the day … ‘we’re all the same size…behind a 45’… LOL! Musicians’ speak, sing, and play, many times, the stories of their (and sometimes our) lives and I like that they can be positive, hilarious and in your face all at the same time! Get Your Power BACK Girl! This has been one crazy weekend…without going into much detail, I’ve been overwhelmed with negativity, it’s been hours of pure disillusionment, where things crashed in my face as I thought I was doing something right for a change, where I was made to feel that my contribution didn’t mean much. Not the best attitude when you are looking for your next employment opportunity! So, I let myself wallow this weekend and gave myself a time limit: that by 7am this morning, that I would make an attitude adjustment and that ‘tendria que salir a conquistar aunque sea parte de mi mundo’, that I would go out an conquer even just a part of my world. Thankfully, I did not forget to ask some of you for help and suggestions to get me out of my funk and back into business…thought I’d share some of these email responses that helped me get my power back … and to my friend who called me at one in the morning after getting my email just to make me laugh … Mil Gracias! * pull out strategic plan; revise as needed; post in area where u spend a lotta time (mirror, kitchen, window, etc.) so u can physically see it.revisit strategic plan. *get real with what u can “secure” with ur current experience, age and gender. u know there r some f#$@%&!$ out there that r haters and u gotta deal wit dat! ain’t nothin’ off the table cuando tengo hambre! * exercise to get rid of stress. * list all the bills that need to get paid and identify the ones that need to be paid for first and let the ones that can wait a little longer. * meditate and live in the present. it’s the only time we have. we can’t change the past, and have no control of the future. today is what we have. * as long as you’ve been a believer – God has never failed you, and he’s not about to now. Say a novena – pray for faith and He will take care of you. * I make sure that I make sure my hair & make up look good. Because if you look good, you feel it! * when I feel as if I want to stay in bed forever, I text a friend for encouragement. * I did a purging of my life’s baggage & past… I cleaned out all of my boxes that were stored in closets or garage, hope chest, jewelry, everything!! Today, I conquered a small part of my world — tomorrow, I’ll do the same! Don’t be afraid to ask for help from your fam, friends, and famfriends! Looking forward to seeing the familia later tonight at the Ranch to celebrate Dia de Reyes! January 6th is Three Kings Day in Mexico, known as the Día de Reyes. This is Epiphany on the church calendar, the 12th day after Christmas, when the Magi arrived bearing gifts for baby Jesus. In Mexico children receive gifts on this day, brought by the three kings, los Reyes Magos, Melchor, Gaspar, and Baltazar. Some children receive gifts from both Santa Claus and the Kings, but Santa is seen as an imported custom, and the traditional day for Mexican children to receive gifts is January 6. 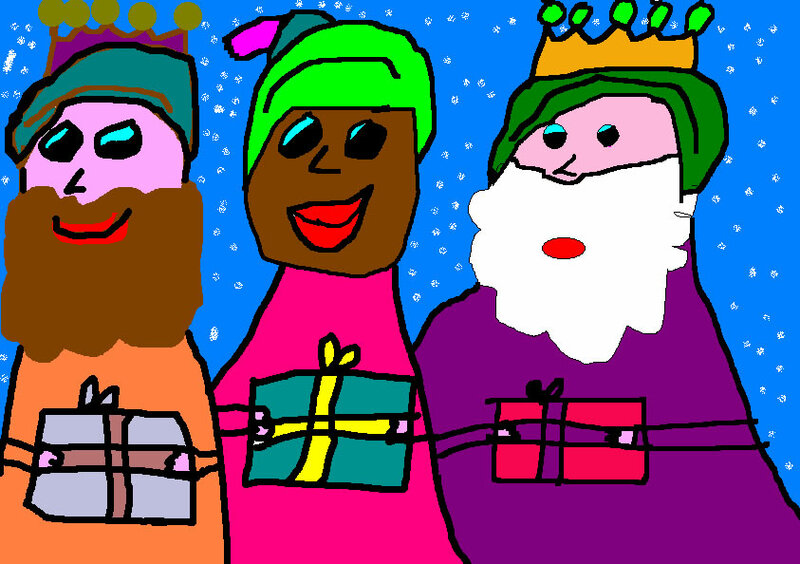 In the days preceding Kings Day children write letters to the Magi requesting a toy or gift that they would like. On the night of January 5th, the figures of the Wise Men are placed in the nativity scene. Traditionally children would leave out their shoes with a bit of hay in them to feed the animals of the Magi (they are often shown with a camel). When the children would wake up in the morning their gifts appeared in place of the hay. Nowadays, like Santa Claus, the Kings tend to place their gifts under the Christmas tree. On 3 Kings Day, it is customary to eat Rosca de Reyes, a sweet bread shaped like a wreath, with candied fruit on top, and a figurine of a baby Jesus baked inside. The person who finds the figurine is expected to host a party on Día de la Candelaria (Candlemas), celebrated on February 2nd where tamales are served. For the first time in many years, I am ringing in the New Year alone … trying to get over this flu, listening to music, or should I say BLASTING music, cleaning the house (as I am so tired of sitting and lying around from being sick). Also, I’m dressed glamorously for the occasion, sweat pants, hair up in a chongo, no makeup, even have a scarf tied around my neck because I’m still feeling sick. One look at this picture and one would think ‘oh pobrecita, solita, what a way to celebrate’. But this is SO not the case! We put so much worth to FEAR and it can make us do some crazy and stupid things — believe me, I have a huge list of tonterias that I have done in the name of fear when I was afraid of being left by some guy, afraid of standing up for myself, afraid of losing ground in my career, afraid of being caught, afraid of getting yelled at, afraid of disapproval, etc. A big part of the fear has been of trusting myself and my instincts about a certain person or situation. Y eso que I’ve always had really strong intuition! These fears would then manifest themselves as migraines, diarrhea, stress, etc. all because I was even too afraid to even think about my fears or my strengths, much less face them. 2010 really taught me that while God drives the car, that I have a lot to do with how my life turns out, my reactions will either drown me or save me. The biggest thing was learning to face myself and my situation — which still is not the greatest but it is what it is. I have really tried to take the desperation and fear out of a lot of my personal situations — not finding another job, how am I going to pay my tuition, how can I spend more time with parents, etc. This is one of the greatest benefits of taking the time to be alone — that you can pray, meditate, think about, and make changes in your life. I find that I’m much calmer about those kinds of things these days and, if I fall off my wagon, I can usually get back there within minutes. So 2011 is a continuation of my ‘starting over from zero’ phase: working my plan, being a fun person to be around, thinking thru my decisions sin miedo with 2 big challenges: STAYING out of my own way when making important decisions and applying this new courage to getting rid of these lonjas and losing some of this weight que ya me tiene harta! I’m ready. Hope 2011 brings you want you want and, more important, what you need.